I haven't logged on in a few months - what exactly needs to be updated and/or isn't working so that I know what to look for? Is this gonna get updated for 3.1? Need to update to change the location of empty bag slots indicator. Try deleting the file "Documents\RIFT\Interface\Saved\SavedVariables\ImhoBags.lua" ...and then log back on and open inventory for all of your characters one by one and see if it properly repopulates. Just noticed that the bags are not showing all the other characters inventory or banks. It has always worked but a few days ago it stopped. Is there a fix for this? I tried to uninstall and reinstall but that did not work either. Thank you for any information, Really enjoy this add on its my favorite. There is a very quick/easy/fast workaround to this folks. If you have the imhobags window open, as well as any one of your regular rift bags somewhere on the screen, just DRAG the item from your imhobags window to any empty slot in your rift bags. The item will not move in the imhobags window, but it will move to that empty slot in your rift bags. Now, you can just hover over it for the tooltip. It literally takes a second to do this. It's a perfectly good way to get around the bug until someone at Trion fixes it. Please read the Addon description: "The tooltip location, size, etc. is known bug with the addon API. There is nothing we can do to fix it at this time." Can't see item tooltips or compare items because it's in the top left corner.. The positioning of the tooltip is completely useless, and cannot be read. This version uses some new code to try and fix the error: "Error: performance warning In ImhoBags / Item.Dispatcher.eventItemSlot"
This code hasn't been used in the addon thus far; therefore, I would love if people could test it out and make sure that it doesn't break anything else. If I'm not mistaken, this is the last "performance warning" errors that people are seeing. Anyway, it would be great if folks could test this feature (if it interests you) or at least update to this testing version just to make sure that nothing else is broken. This addon does not use libInventory at all. (See /imhobags/RiftAddon.toc for Dependencies and embedded libraries.) Personally, the only addon I have that uses it is "Teleporter". The bug you reported is something I've been meaning to look into lately. I'll see if I can track down what's causing it. Also I noticeed that stack counts aren't updating properly. When I click to add something from my back to my vault the stack in the vault doesn't show the new value. Please note that I'm currently in the process of updating this addon. The packager automatically creates 'alpha' builds, which should work, but ..please remember that they're just alpha builds prior to a new beta release. I just downloaded inhobags from curse and stated using it. So far it has lots of potential. One problem I’m having is with the Guild Vaults display. There are 4 vaults in the Guild Bank and I only can view the top or Vault 1. I couldn’t find anything in the comments addressing my particular issue. When displaying the Guild bank I only can see the first Vault. I don’t see any way of paging through the other Vaults. Also, it would be nice to see all the Vaults displayed at once, this would aid in item placement. This one I get whenever I'm crafting and using a mat that's in a bank vault other than the default vault (I have 5 vaults). Let me know if there's any additional info I can provide or if I can help in some way. 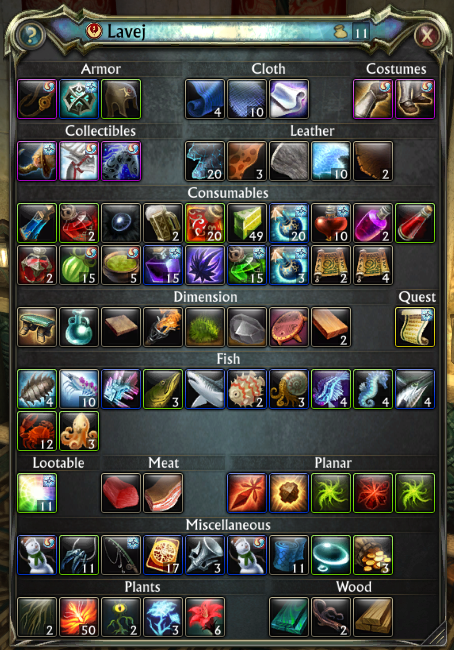 Thanks a ton for this addon, I couldn't live without the tooltip showing me how much of anything I have on me or in my bank. Your work is greatly appreciated!! I'm getting this same problem, so add me to the list of people to notify when it's fixed thanks.